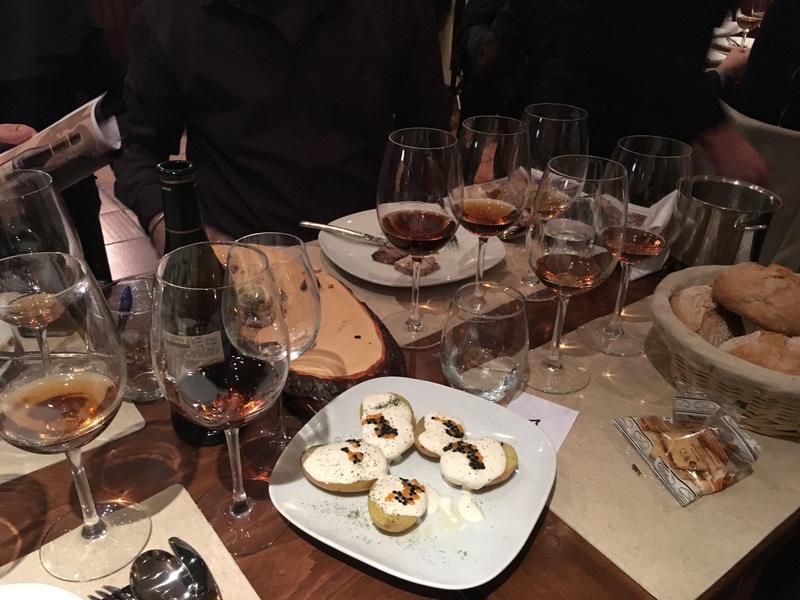 Terrific tasting last night at Taberna Palo Cortado: Lustau‘s range of Almacenista wines (see this excellent post on Sherrynotes for background). 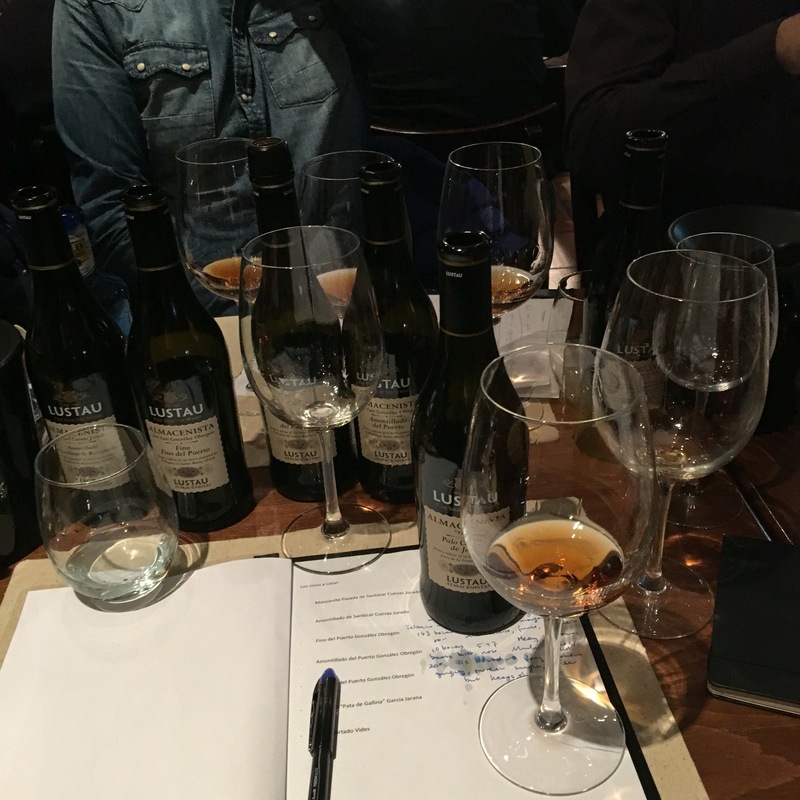 We had almost the entire range – the only one missing was the Jose de la Cuesta Fino del Puerto – covering the full spectrum from fino to oloroso and the whole region from Sanlucar to el Puerto. There were some real gems – the Fino del Puerto and the Oloroso Pata de Gallina were my favourites – but the overall level was excellent. First up was the Manzanilla Pasada by almacenista Manuel Cuevas Jurado in Sanlucar, a relatively young and delicate example of a manzanilla pasada, with notes of apples and almonds, and a great start. That was followed by the Amontillado de Sanlucar from the same Almacenista, a typically elegant and mineral Sanlucar amontillado that was just a little hollow in the middle. Then we moved to El Puerto de Santamaria and the Fino del Puerto by Jose Luis González Obregón, a brilliant, muscular seaside fino with notes reminiscent of rockpools. That was followed by an Amontillado del Puerto by the same almacenista, again a more muscular effort than its Sanlucar cousin and a big and tasty wine. 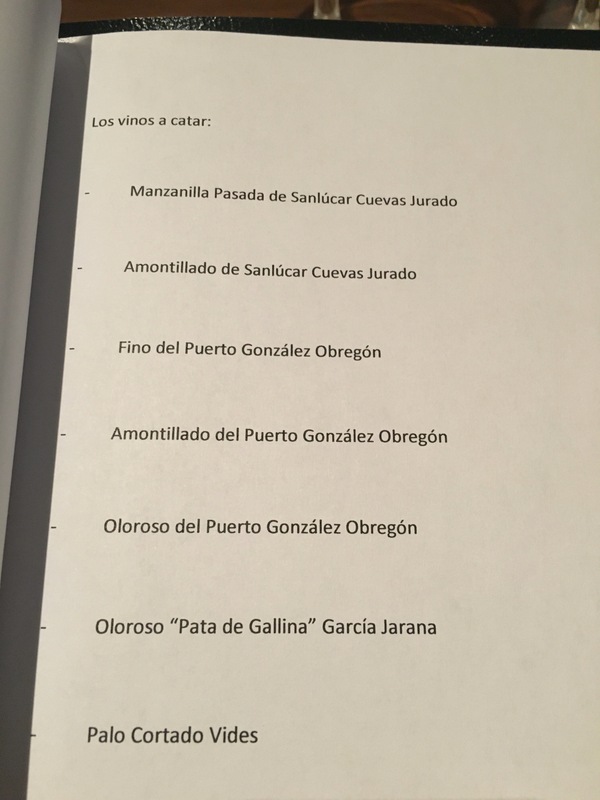 The last wine from el Puerto was the oloroso, again by Jose Luis González Obregón which was richer in texture and intense in flavour but a little woody for my taste. Then to Jerez de la Frontera, and a palo cortado by the almacenista “Vides” (owned by a Domecq, but not one of those Domecqs) which was a spicey, racey wine and a great example of the style. It was a brillian sample of styles and locations, Carlos and Claudia from Lustau were engaging and good company and the cata was also high quality in terms of the information and content: straight to the point, most of the facts (not the vineyards, unfortunately, but otherwise very good), and thankfully not too much blarney. And to be fair there would be scope for a fair bit of blarney here since it is a pretty good product concept (as one of my colleagues pointed out): the identification with the almacenistas gives the wines a bit of identity and context. I for one would prefer to see some vineyards referenced and even some vintage wines (like the excellent 1997 Oloroso) but this is definitely a step in the right direction. I am going to allow myself one gripe: the packaging is elegant and quality but ¿it is really necessary to have a unique bottle shape? This one isn’t as bad as some but still plays havoc with my limited domestic storage. What can I say about La Taberna? The supper was fantastic and the atmosphere was superb (increasingly boisterous as the wine flowed). Really great to be there and looking forward to my next excuse.